Seeing how this website does have the word “festival” in its name, I thought it would be a good idea to actual talk about a festival for a change. I’ve been going on and on about wineries, but not today. Today we’re going to be focusing our attention to a festival. Not just any festival, it’s one of the most popular Virginian wine festivals, the one on the Sunny Slope Farm. What you need to know about this festival is that it takes place on August 6th, over 2 weeks from now, so there’s still plenty of time to make a reservation. Before I forget, reservations can be made using the festivals official website. Actual location of the farm where the festival takes place is a town called Harrisonburg in Virginia, obviously. Farm itself is a venue for weddings and other similar celebrations. 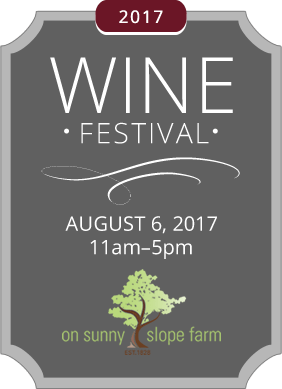 There won’t be such a large number of participating wineries at Sunny Slope. Only about 8 or 9 of them are scheduled to appear at this time. More might announce their presence until the festival actually kicks-off. On top of that, there’s also going to be lots of great food, live music, arts & crafts vendors and lots of other fun activities. Let me know if you plan on visiting, I might drive to Harrisonburg as well so we can meet up. Cheers.